I’m one of those weirdos that must have something hot to drink first thing in the morning, even if it’s 80-degrees at 6am with 95-percent humidity. I also eat hot soup for supper in the summertime, but that’s beside the point. I love a good Earl Grey latte in the morning. I fill the tea cup half-way, and then cover it while the tea steeps to an extra dark brown, all the while my milk steams off to the side. It’s just a lovely way to wake up. Black tea is about the most amount of caffeine I drink. I do love coffee, but it does not love me. It makes me jittery and sleepy all at once (what?). I had an iced coffee at a coffee shop one afternoon last week, and I feel like I’m just now back on a regular sleep schedule. Those coffee beans makes me crazy! So, if I feel like I need another pick-me-up in the afternoon, I want a re-do of that morning’s perfect latte. But maybe a re-do that is a bit more acceptable to drink on the front porch while the mailman walks by? Iced Earl Grey latte, you were always made for my popsicle mold. The truth: you don’t have to layer the ingredients to make this popsicle taste delicious. If layering stripes in a popsicle mold every half hour for four hours (count the layers!) sounds like something you don’t have time for, please, stir it all together before freezing. I’m not going to confess what the white substance is in the popsicle. Is it heavy cream (shame on me! ), or is it coconut cream? Or, light coconut milk from a can? Ok, fine. The ones pictured have light coconut milk, but that’s only because I scarfed down the heavy cream versions while I was only one layer 3. Heavy cream all.the.way! I’ll leave your calorie choices up to you, though. Add the boiling water in a glass 1-cup measuring cup. Add the tea bags. Cover and steep 10 minutes. Remove tea bags, and let cool for 20 minutes. Stir in the agave nectar. Pour the coconut milk (or cream) into a measuring cup with a spout. Place 5 popsicle sticks in your popsicle molds. Make the first layer the tea. Let freeze for 30 minutes before adding the coconut milk layer. Repeat until all liquid is used. You should end up with 5 popsicles, depending on the size of your molds. I LOVE AN EARL GREY LATTE! And I’m so the same – I have to have a hot drink in the morning. Even though I live in Queensland, where I swear it’s always too hot. These might be a great solution to my predicament! These are beautiful! 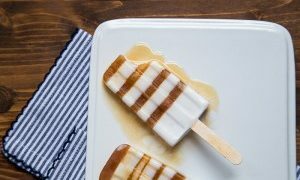 I love the idea of tea with cream all in popsicle form! These are insane! I absolutely love everything about them. This is such a yummy sounding flavour!! I absolutely love it! I’m with you, it can be 110 degrees outside and I still have to have hot coffee or tea first thing in the morning! I’ll settle for a stripey tea pop for dessert though =) Pinned! Look at how cute they turned out! 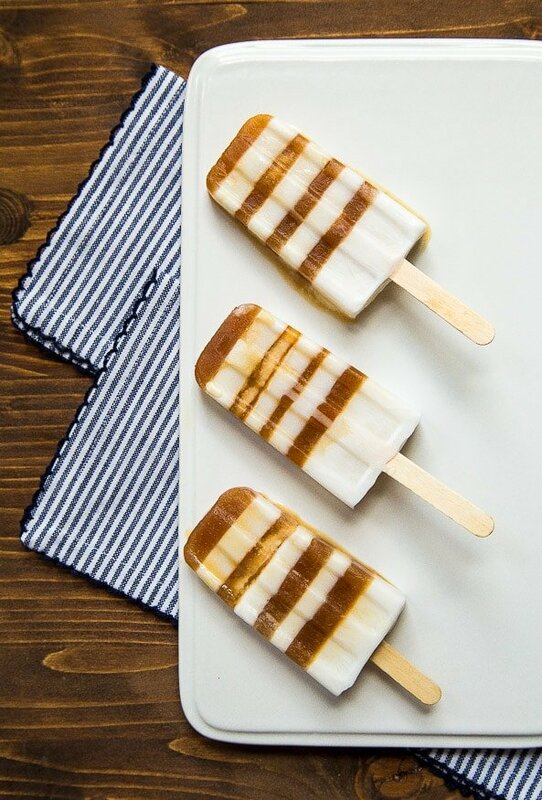 My attempts at stripy popsicles have been…well, less than stellar. I guess I don’t have the patience. I’d make these, though, all stirred together and delicious! I need a caffeinated ice pop in my life for sure. Early Grey Ice Pops are new to me but look delicious! I’m sitting here on my cold porch in Buffalo needing a pick me up and you just gave it to me! Oh this sounds divine and I’d definitely find the time to layer these, because they are SO gorgeous! I bet the flavors are so delicate! The recipes that have come to me in dreams have been some of my total favorites. LOVE this one! these look so pretty and i love me Earl grey as well in the morning. You have a ridiculous amount of patience. I was going to make my porter pops with a bunch of stripes and got bored of waiting after five minutes. OMG this are not only brilliant but they are just beautiful!! Love those layers. Sooo perfect!! I cannot wait to try these. You, my friend, are a GENIUS! I’m buying a popsicle mold online right now because it’s time for me to get on this popsicle bandwagon. First up, THESE guys!! These are wild! Of course I like the way you made them. I have never heard of a tea popsicle. I am not much of a popsicle eater, but I would definitely make an exception with these little zippy zappy guys. These are just the kind of pops that I would dream about too! So adorable! I love the layers and how easy they are! Heavy cream all the way is right! Well aren’t these just the cutest things ever! I’m all for the hot drinks in the morning too, regardless of outdoor temperature! I’m mad for those pretty stripes! Looovvveeeee these earl grey pops. . don’t you love it when you dream something up and it actually works?! Beautiful!! and I wish I didn’t love coffee as much as I do.. I probably need to take a note from you on the tea drinking. Seriously love these pops. Double the bergamot makes my heart explode, I LOVE THESE!! My girlfriends and I love sharing cool blogs we find. We’re big fans of “Food 5″2 and “Cooking With Mr. C.” I just found your blog and love it. I will share it with them. Love me some Earl Grey. These pops are the cutest. 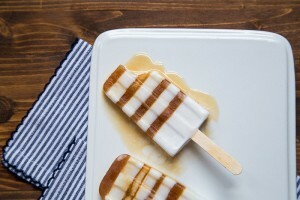 OMG … I am dying over these popsicles! I love, love, love Earl Grey … and I cannot wait to make these! Positively awesome! Stop it! This should be tiramisu-flavored! First thing I thought of. It is so pretty though! It’s amazing what you come up with! These are gorgeous!!! i do love all the stripes in them, but I’m not sure I have the patience to wait it out!! OMG. I may leave work right now to go make these….they sound so delicious!!! Pinning now! I, too, love me some soup in the summertime. Soup is seasonless, much like hot coffee and tea. You just need it yearround, and those who don’t understand us, clearly don’t have good taste in food. And oh, these pops? LOVE. I’m not sure how I missed these before, but O.M.G. they are adorable. I drink a ridiculous amount of tea — usually English breakfast, but also coconut creme, green tea with mint, jasmine green and all sorts of Earl Gray-esque flavors — and I think a popsicle version would be perfect. Plus, stripes. Can’t handle it. Has anyone actually made these with low fat coconut milk and do they taste good? Just want to make sure it’s worth 4 hours of work lol. These are beautiful and I’m sure taste amazing! Need to test these out! hello……………..im celina and can i replace agave nectar with sugar?? I don’t think so, Celina. Sorry! I haven’t tried the recipe any way except the way you see it written. I did them with sugar and they came out delicious! I stirred twice the sugar into the tea while it was still hot. I think I might split it up between the tea and cream next time. Still, delicious! How did you get the layers so perfectly even?? The presentation of these pops is beautiful, and I’m sure they taste even better! Or could I add Bergamot drops from doTerra to ‘strengthen’ it?